Take a 7 hours trips to Ol Doinyo Lengai, the only active volcano in East Africa. 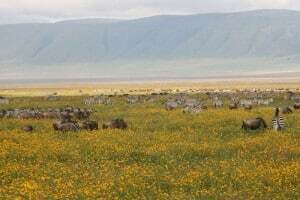 The volcano is located in north of the Ngorongoro Crater Area, and at the south of Lake Natron. The name Ol Doinyo Lengai is a Maasai word for “the mount of god”, and reaches an altitude of 2878 metres. The last large eruption was in 1966, afterwards followed by two smaller eruptions in 1983, and 1993, the volcano never killed a person. It is possible during your safari to climb the volcano, the trip takes approximately 7 hours. It is a considerably steep climb to the top, but the views are spectacular and the climb is really an adventure, you’ll see Lake Natron and you overlook the endless grass plains, you also see the conical top of Ol Doinyo Lengai which still spits out lava, you will reach a point just under the real summit. You are accompanied by one or more Maasai who act as your guides.